PressBooks is going open source. We will be releasing PressBooks as a WordPress plugin (to be used on a stand-alone WordPress install), under the open source GPL license, target release date: end of January, 2013. See below for more info, and some answers to questions you might have. And please get in touch if you’d like to know more. More talking about books at CBC Radio: Spark, with Nora Young, specifically books and the internet. I’m batting clean-up, segment starts at 45mins. Listen here. Book: A Futurist’s Manifesto – Available Now! More than a year ago, I pitched a book idea first to Brian O’Leary (who became the co-editor), and then to Joe Wikert at O’Reilly Media. It was indeed a “book idea” in every sense of the word(s), and I am thrilled to announce that the “final” product is available today. Book: A Futurist’s Manifesto, is finished, and you can now find in print, ebook, and online … at: Amazon, Barnes & Noble, and of course at O’Reilly. (Coming soon: iBooks and Kobo and others). A new book about the future of publishing, built on the PressBooks platform, a new way to make books. 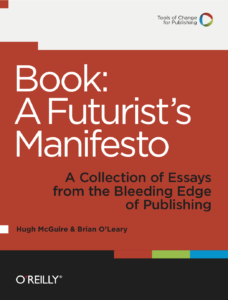 Book: A Futurist’s Manifesto: Essays from the bleeding edge of publishing (buy ebook / read free online), a handbook for publishers of the future, has been released by O’Reilly Media. It was built on the new, simple book production platform, PressBooks.com. Edited by PressBooks founder Hugh McGuire, and long-time publishing thinker and doer, Brian O’Leary, it contains essays from leading practitioners in the trenches of books & technology, including Liza Daly, Craig Mod, and Laura Dawson. We are pleased to announce the first published book produced using the PressBooks book production platform, suitably titled: “Book: A Furturist’s Manifesto (Part 1) … Essays from the bleeding edge of publishing.” The book is published by O’Reilly Media, and edited by PressBooks founder Hugh McGuire, and long-time publishing thinker and practitioner, Brian O’Leary. The entire book production process — authoring, editorial, copyediting, and proofreading, as well as ebook production (and typesetting and print production to follow), took place on PressBooks.com, a new publishing workflow tool, built for anyone publishing books and other long-form structured documents. * You can buy the book here. * Or read it online (for free), at book.pressbooks.com. * You can find out more about PressBooks here. 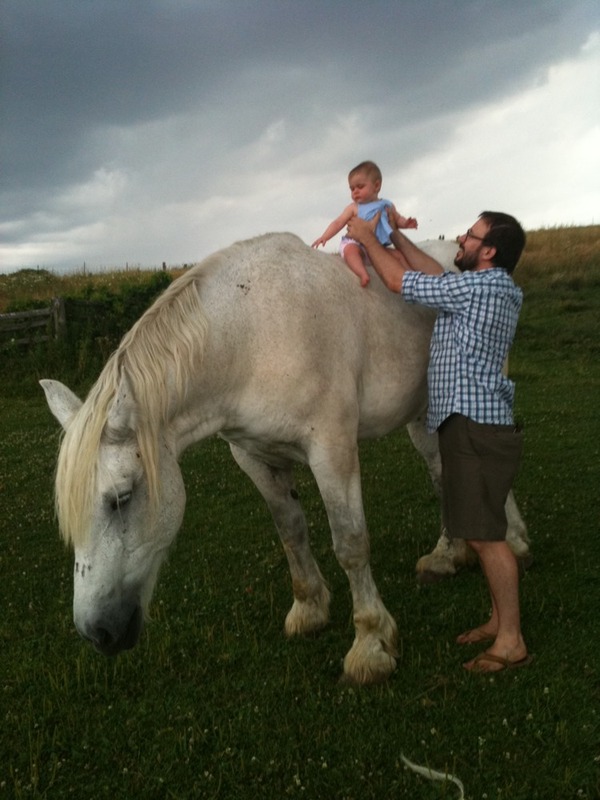 This is Beatrice’s first time on a horse, on cousin Al’s Percheron Hannah (Johanna I think), who once was part of a driving pair, “but” her partner died a couple of years ago. Unfortunately, Hannah’s back leg isn’t right, so the old girl isn’t long for this world. I’m glad Beatrice got to meet her. David Wilk invited me to his Publishing Talks Podcast, to about LibriVox, iambik, libraries, PressBooks, and general future of publishing stuff. And here is the audio [mp3].